One of the biggest benefits to a green cleaning program that’s not always spoken about is the huge cost savings it can yield. Many with experience in the field have already moved far away from the old, mistaken belief that green cleaning costs more. Unfortunately, those who are not as familiar with green cleaning—and many in positions to approve or reject green cleaning purchases—are still misinformed. Pat Pizzo, the assistant superintendent for business and finance at East Meadow School District in Westbury, NY, has firsthand experience with cost savings. In fact, his department has been able to save more than $365,000 (and $135,000 in 2016 alone) by making the switch to green-certified products and equipment. Part of Pizzo’s award-winning green cleaning program is detailed and strategic program assessment, which includes analyzing the amount of money saved so that he can convey those numbers to those in charge at the district level. One of the key ways East Meadow School District was able to reduce costs was to explore, test and implement procedures and equipment that eliminated chemicals whenever possible. They started with floor care, eliminating the need for chemicals and significantly reducing labor costs by switching to diamond pads and ionized water. They completely eliminated the use of stripper and buffing chemicals, so that was a line item that they could cut off the budget right away. A change to a greener floor wax eliminated buildup on baseboard, cutting that item out of the budget and also stretched the amount of time in between waxing by two additional years. 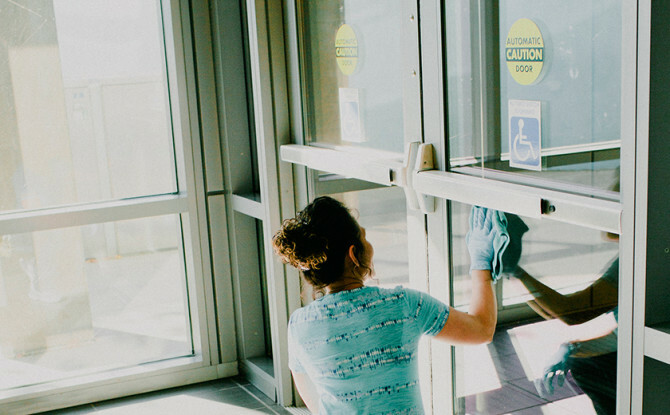 The reduction—and often, elimination—of chemicals stretched beyond floor care to windows and glass, greatly reducing the amount spent on glass cleaners. Sustainability and green cleaning start to complement each other when cost savings are concerned. For example, Pizzo’s team uses all LED lighting inside and outside his buildings, which last longer and use less energy. Money is cut from the energy bill and labor costs are cut, too. Sometimes, after an initial investment, a program must be patient while they wait to yield cost savings. As you can see from the example at East Meadow School District, it is well worth the wait! Pat Pizzo is a member of the Green Clean Schools Leadership Council and will be presenting in detail on cost savings and program assessment in October at the Green Clean Schools Forum.